Discovered in 1947, the Dead Sea Scrolls have been available for viewing only in a museum in Israel…until now. 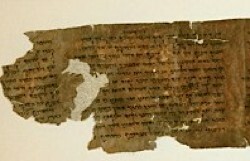 Thanks to some expert digital photography and a project set up by Google, high-resolution photos of five of the seven original Dead Sea Scrolls can now be seen online. The Digital Dead Sea Scrolls Web site offers a peek into the distant past, allowing people to view and examine the scrolls in fine detail, with accompanying text describing the scroll, its history, and its meaning.